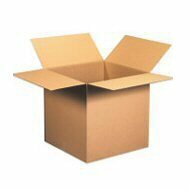 Over 700 sizes of corrugated shipping cartons available in regular, multi-depth, heavy-duty, double wall or white varieties. Our stock boxes are strong 200# / 32ect (unless otherwise noted). All are shipped and stored flat and are 100% recyclable. If you don’t see the size you need please contact us and we’ll find you the best available option.